‘Shanghai Surprise’ is a 1986 British adventure comedy film directed by Jim Goddard, starring Sean Penn and Madonna, that is set in 1937 Shanghai during the Japanese occupation. Although the film was a notorious “box-office bomb” and “critical flop,” it nevertheless was able to retain a remote sense of glamour among the wider public. The title has been hailed as an inspiration and is often quoted by writers and artists when portraying Shanghai. ‘Shanghai Surprise’ is a project curated by Shanghai-based Leo Xu and Azure Wu who have experienced the city’s metamorphosis from 2000 to present. During this period both Leo Xu and Azure Wu worked as curators in local museums and more recently have held positions such as curator, art dealer, writer and editor. Inspired by the film’s title, this eponymous project is envisioned as a time and space capsule as opposed to an encyclopedic gesture. Its development is based on minute notes from the curatorial sketchbooks of Xu and Wu, which represent the forgotten and unforgettable moments in Shanghai’s contemporary art sphere that continually produces new ideas and surprises. ‘Shanghai Surprise’ comprises of two parts: a group exhibition featuring works by defining artists, young Chinese and expat authors who possess strong ties to Shanghai-geographically or culturally; and a mobile library that captures Shanghai’s transforming cultural landscape. Central to the exhibition is a selection of works that are unique or less exhibited and have possibly faded into oblivion after their initial premiere. According to Xu and Wu, the combination of iconic works and rare pieces marks a distinctive narrative of the last ten years of Shanghai’s production of contemporary. These works will be accompanied by a presentation of recent works by a group of emerging artists who are either based in Shanghai or draw their inspiration from the city. Titled ‘Archiving Contemporary Art In Shanghai Since 2000′, the mobile library provides access to a rich collection of printed matters and digital resources. It documents the activities of Shanghai-based artists, collectives, as well as programs of institutions, galleries, alternative spaces and cultural councils of foreign consulates in Shanghai since 2000. The mobile library is the first project of ‘The Subscribers’, a curatorial initiative founded by Leo Xu and Azure Wu. A fully illustrated catalogue will be published in conjunction with the project. 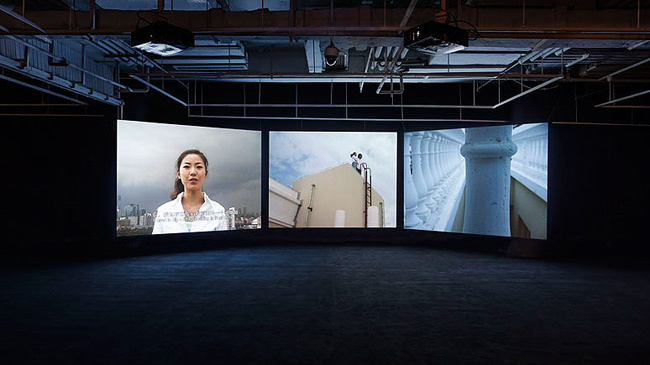 ‘Shanghai Surprise’ is organized by Leo Xu and Azure Wu with curatorial assistance of Kim Wu. The show is generously supported by ShanghART, WTi & CP DANMARK APS. Installation view. Photo: Justin Jin. Published on March 6, 2013 7:04 pm.